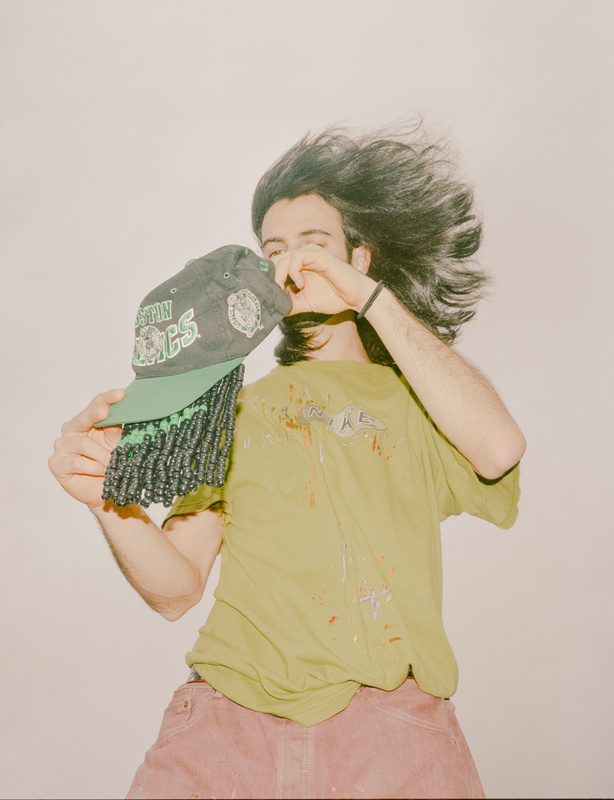 Designer Pat Peltier is dressed in the hand-embroidered Carhartt facemask, vintage Champion crewneck and hand-embellished vintage Levi’s jeans. At first the splatter looks like paint—the last thing you’d want on a new T-shirt you just paid $100 for. But this delicate “drip” is actually scrupulously embroidered, one in a roster of visual puns that Bandulu is becoming known for. As Pat Peltier, the brand’s founder, points out, what looks like paint is thread, what looks like a fragment of a Spalding basketball is a terracotta planter, what looks like an infant-sized Nike Air Force 1 is in fact a tiny wax candle. As this kind of careful attention to detail would suggest, Bandulu’s clothes, objects and accessories are almost always 1 of 1. The brand doesn’t manufacture materials or use traditional “blanks.” Instead, Peltier himself thrifts used clothing to upcycle—a process in which a discarded item or waste material is transformed into something worth far more. Peltier was an artist before he was a designer. Disenchanted with studying animation in school, he turned to more hands-on materials and media. He had also long collected vintage sport- and streetwear, but time in the studio took a toll on his closet. In an effort to resurrect articles of clothing that had been splattered with paints and glazes, Peltier started embroidering onto and over the stains. He found that these processes of creative repair were quite therapeutic. Friends and even passersby inquired about his handiwork, assuming the interventions were deliberate. Within a year, Peltier rolled out his first collection. Bandulu—which means “fake”—avers to be both an art practice and a brand, consciously rejecting the customary expectation that the two are mutually exclusive. And Peltier likes to emphasize the wide range of his influences, which cross industries, disciplines and even cultures to encompass everything from the painterly abstraction of Monet to the irreverent innovation of Dapper Dan and creative shapeshifting of KAWS. 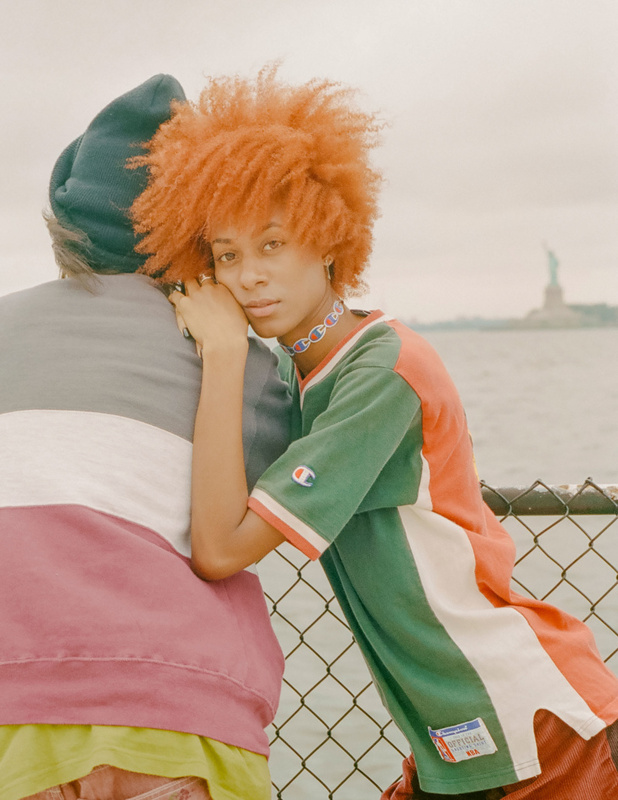 Larisa Sterling, a friend of the brand, shows up the Statue of Liberty in the Bandulu Champion logo choker and vintage Champion shooting shirt. When Bandulu’s first collection came out Peltier was living in Boston, first for school and then while working for the sneaker and streetwear boutique Bodega, where he ascended to head designer. Nearby thrift and Goodwill stores were overflowing with local school and sport merchandise, especially made by Champion. At the same time that Bandulu was emerging, Champion was also experiencing a renaissance, coinciding with a renewed pop-cultural interest in sportswear. This classic American brand, which turns 100 next year, was a natural choice for trend-savvy shoppers when it was suddenly cool to wear track pants again. The company (founded by brothers Abe and William Feinbloom in 1919 and acquired by Sara Lee Corporation in 1989) had a history of being a template brand, the master blank for amateur, college-level and even professional sports teams. And, as the iconic “C” logo had traditionally been embroidered, it was the logical complement to Bandulu’s painterly, three-dimensional embellishments. Soon, Peltier was sourcing other brands too, such as Nike and Converse, drawing from whatever tees, sweats, jeans, hats and even sneakers he could find. Adorning, inverting and swapping preexisting graphics expanded to logo flips (an SMU hoodie now reads “SMH”). But Bandulu’s explorations of branding, identity and authenticity are playful rather than sardonic. It is true that, like much art-adjacent meta fashion, singularity and scarcity are fundamentals in Bandulu’s value-equation. But in an industry teeming with young brands vying to represent niche concepts, styles and materials in the mass market, Bandulu attempts the opposite, repurposing the most wildly available, diluted brands in the world to make something one-of-a-kind. And in a global economy where growth—and success—are imagined to be infinite, Bandulu is decidedly finite. 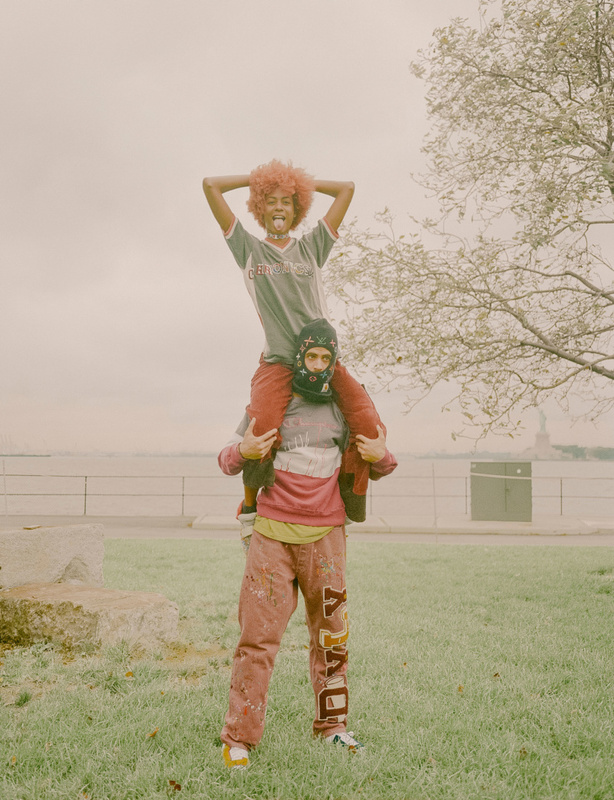 Five years later, with the help of a few assistants, the brand still produces unique items, made by hand in Peltier’s studio in Brownsville, Brooklyn. Peltier puts on the hand beaded vintage Celtic’s snap-back. To the extent that it destabilizes the status of authenticity and originality in today’s consumer culture, Bandulu’s clothing is also a reflection of the precarious contemporary condition of fashion at large. Bandulu’s tagline is “you know it’s real if it’s fake.” Fakes—whether knockoffs, counterfeits or bootlegs—are not technically illegal unless so similar to their “real” counterparts that customers are genuinely unable to tell them apart. But how closely are we expected to look? At first, Peltier actively avoided sharing close-up images of Bandulu’s designs, which contributed to some amusing miscommunication about how the pieces were made. The recognition delay one experiences glancing at Bandulu’s signature splash of “paint” is not unlike the effect of the distorted dimensions of “Damier Signature” checkers on a bootleg Louis Vuitton wallet, or Payless’s notorious four-stripe rendition of the Adidas Superstar. Familiar but foreign, each pretends to be something it’s not and produces that moment of perceptual rupture we experience when an object both entices and eludes us. Artists have long used a similar approach—some would argue that artists’ most fundamental task is to help us see the familiar in new ways. Peltier seems to consider every avenue of interaction between Bandulu and its consumers, or “viewers,” from the magazine spread to the e-shop page, extending this rupture into the marketing and positioning of the brand as a whole. Perhaps what makes Peltier an artist is not just that he paints or sews, but rather that he reframes our perceptual relationship to things we thought we knew. But how fake are these “fakes”? In a surreal twist of our global marketplace, “fakes” are often made in the very same factories as the “real” goods. Vendors have adapted to the times, now referring to their wares as “replicas,” promising that they are truly identical to the real thing. And though “fast fashion” is usually condemned as particularly detrimental, it’s a mistake to presume that the categories of fast fashion versus luxury fashion versus everything in between represent any material difference beyond the arbitrary semantics of branding and marketing that so insidiously delineate our realities. High-end and budget fashion labels manufacture their goods through the same subcontractors with the same materials, workers and resources. Some brands have engaged tongue-in-cheek satires of this artifice to produce real profits. When Virgil Abloh was called out for using Rugby Ralph Lauren blanks to produce Pyrex Vision screenprinted shirts for 15 times the cost, he printed a quote from his critics on a new batch of rare concept wares. Whether we like it or not, we are all embedded in these intersecting systems of production and consumption. But, unlike many other brands, Bandulu doesn’t leave us with just another limited-edition, fashion-about- fashion graphic tee, made in Bangladesh but unwilling to talk about it. (Peltier and I also discussed how tired we are of graphic tees, generally.) Instead, it takes as subject matter the construction of branding as well as the realities of its own supply and manufacturing chains. All institutions are brands and all brands share an ideological playbook, whether we are talking about Louis Vuitton or Harvard. What also becomes clear is that anything can be branded, and that what designates one from the other, or the real from the fake, is actually quite arbitrary. Champion becomes Nike, Nike becomes Bandulu. As this distinction unravels, so does fashion’s usual symbolic bundling of production and product, exposing instead the vast—and all too literal— discrepancies between the two.